I dreamt up a wonderful quesadilla recipe the other day. It is filled with grilled veggies, avocado and cheddar cheese. The recipe seemed incomplete though… that is, until I had the idea of a tasty, creamy spread to pull all the flavors together. 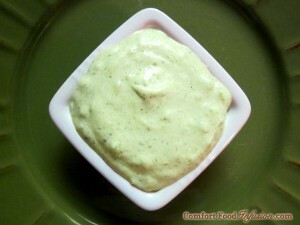 I absolutely love cilantro, and having a creamy spread infused with its flavor could be perfect in so many foods. Mayonnaise and plain yogurt (you could use sour cream) are the base, and a bit of jalapeno and a few dashes of seasonings, bring it all together fabulously. Use this as a salad dressing, a spread in sandwiches, on pizza, as a dip with vegetables or crackers, or whatever else you can think of. Add ideas in the comment section! A creamy, delicious spread combining, mayonnaise, yogurt, cilantro, jalapeno and seasonings. This has many uses from a spread to a dip. **Xanthan gum is used to thicken salad dressing (it is also used in gluten free baking). It is available in most grocery stores, and can commonly be found in small quantities, so you don't have to purchase more than you need. You might notice that blending/processing this causes it to thin a great deal. If you leave out the xanthan gum you simply will not have a thick spread. Using it is completely optional.